The Urban Freight Lab (UFL) brings together transportation engineers, urban planners, retailers, freight carriers, technology companies supporting transportation logistics, and multifamily and commercial developers and operators. With a total population of 725,000 and a density of 8,350 residents per square mile, Seattle is now the fourth most-congested city in the country. As we add new residents with appetites for near-instant gratification, how can businesses operating in urban environments like Seattle—with aggravating traffic and competition for street space—meet customer expectations for quick deliveries? The Urban Freight Lab (UFL), part of the Supply Chain Transportation and Logistics Center at the University of Washington, investigates high-impact, low-cost solutions for businesses delivering goods in urban settings and cities trying to manage limited curb and parking space where delivery trucks, bicycles, pedestrians, and cars all need to coexist. 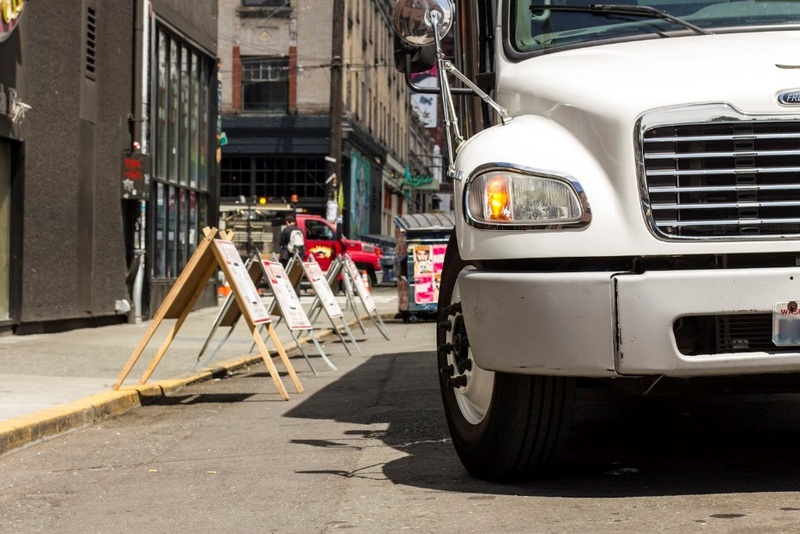 We work with of retailers, technology companies, goods delivery firms, building owners, and cities that need to manage urban street space for multiple uses, and the City of Seattle Department of Transportation (SDOT). The UFL is a structured work group that is comprised of senior executives from retail and wholesale companies, logistics and goods delivery firms. Lab members act to improve the management of both public and private operations of urban goods delivery systems by engaging in strategic applied research and identifying priority problems for future research projects. To achieve its goals the Lab collects original, granular urban goods system data as well as existent data, conducts analyses, develops promising strategies, and pilot tests those strategies on the street and in urban buildings. Since our launch in October 2016, the UFL has completed an innovative suite of research projects on the Final 50 Feet that provide foundational data and proven strategies to help cities reduce truck dwell times in load/unload spaces, and failed first delivery attempts by carriers, which lessens gridlock. Media recognition of the Urban Freight Lab and presentation invitations continue to grow in the U.S. and internationally.